Mukesh Nishad, son of Mantoora and Tejau Nishad, was born in Pune at Kailas, currently living in Mauli Garden, Dhanori. He is the youngest of four siblings. His parents are illiterate, but the father can sign and knows the numbers. The family has moved to Pune from Bimitrajila in Chhatisgarh and is living here since last 10 years. Their oldest daughter has never been to school, but younger daughter is living in native village with relatives and studying in 10th standard. Their older son has been dropped out from school after 7th standard. With no motivation for education and no other child going to school in Pune, parents did not think by themselves about Mukesh’s education. Mukesh was 6 years old when Door Step School surveyed the labour camp on construction site under the Every Child Counts campaign. With help of DSS field staff, Mukesh’s parents enrolled him in school. Initially Mukesh did not speak Hindi or Marathi. He used to communicate in their native language with his family. After starting the school, he learned other language very fast. Now he answers in Hindi and Marathi fluently. He looks confident while talking in Marathi. Parents are also involved in Mukesh’s education. They have been living in this particular area since last 5 years only because his school is very near from here and because they seriously want him to study. 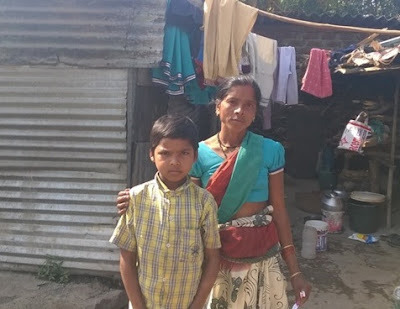 His mother told us that she wants him to complete his education and get a respectable job so that he would not have to do physical labour like his parents. She hopes that education will help him earn more and lead a better life. Mukesh’s father always attends the parents’ meetings at school. He also attended the cultural programme at school and liked it. The parents ensure that Mukesh studies well at home as well. This family is a motivational example for other non-Marathi parents who are worried about the language barrier in their children’s education. Mukesh’s case proves how smart kids are at this age and how sooner they get adapted to the surroundings than the adults. Hence, difference in languages cannot be an excuse to keep children away from education.